Samantha Stovall of UTC Aerospace Systems was selected as this year's Mentor of the Year. 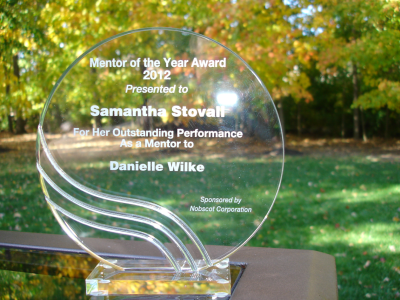 Samantha was actually nominated by three mentees, Danielle Wilke, Matthew Patterson and Tina Lake. 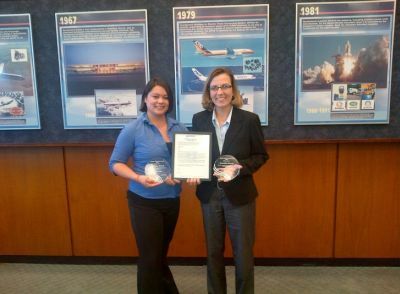 In Danielle's winning nomination she told of how Samantha helped her attain a big promotion within UTC Aerospace, as well as helped guide her in the right career path direction. "Samantha is an individual that exemplifies integrity, poise, intelligence and leadership. As a gender minority in the aerospace industry, having another female to help guide me through my career education has been key in my success and growth. Samantha always leaves an open door for any confidential questions regarding workplace environment and career choices and situations I can always trust her to have my best interest at heart and trust her advice to guide me in the appropriate direction when necessary." Three honorable mentions were also chosen for special recognition from the 150 nominees out of a pool of more than 5000 mentors. The Honorable Mention winners are Blair Selber of HSBC, Judy Novak of The Women's Alliance (TWA) at Xerox, and Craig Picinich of Covance. Craig Picinich was nominated by mentee Timothy Lamendola. Congratulations to Samantha, Blair, Judy and Craig! They each exemplify outstanding mentoring skills and attributes and service to their organizations. Mentor Scout would also like to thank all of the mentees who took the time to recognize their mentors by sending in their nominations. Each one of you and your mentors are winners in your own career and life development! From all of us at Mentor Scout we extend our warmest aloha to all the mentors and mentees participating in their company or association mentoring program.